And welcome to my site. My friends call me Jules, and I'm passionate about photographing individuals, children, families and pets, especially dogs and horses. I'm happy to help anyone gain some precious reflections of their life at the location of their choice using nature's ambient light. I also have a home studio set up in Franktown for inclement weather or formal portraits. Living in both Franktown, Colorado and Pensacola, Florida affords me the opportunity to photograph clients in a variety of locations. With my husband, also an avid photographer, we travel quite a bit to photograph wildlife in their natural environment, which means I might very well be in your neck of the woods! So even if you live outside of the Denver or Pensacola area, contact me. I might have plans to be near you. As with any profession, one must train to become proficient and gain expertise in their practice. 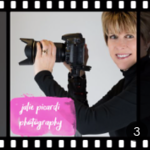 I have taken classes and workshops at the Rocky Mountain School of Photography and have studied on location with photographic artists of national and international acclaim such as Wendy Shattil, Bob Rozinski, Cindy Goeddel and Syl Arena. As a dedicated student of this art, I also utilize online study courses frequently. An additional accomplishment of which I'm quite proud... my photo of fox kits playing in the Tetons was selected as a top 250 finalist for the Audubon Society of Greater Denver Share the View International Photography contest, from over a thousand photos submitted. What you pay: My fee is $150 for 20, possibly more, professionally edited images uploaded to my website. This fee also includes a complimentary 8x10 edited portrait of your choice sent to you plus your own personal app which you may download to your phone for easy access to view your photo gallery. I stand behind my images and should you not be impressed, we will repeat the shoot until you are! You are free to order any portraits you like through SmugMug, a company which stands by their products with a 100% guarantee. For an idea of prices, an 8x10 print is $15.00 and an 11x14 is $25.00. Their high-quality lab has many different options, sizes, and products available for your consideration. You may also purchase a personal license for $10 and download any or all the high-resolution photos I create for you for your own personal use to order at your preferred lab. A gallery of low-resolution photos suitable for displaying on the internet will be available for you to download for a small fee of $0.99. Repeat clients are automatically entered into my Friends list for a 20% discount on future shoots. Memories are wonderful but so often they are pushed to the deepest shadows of our mind and not easily shared with others like a cherished photograph. Any image on my SmugMug site is available for purchase. Simply click on the blue Buy button to bring up the menu of what options are available for the photo you desire. Final sharpening is done by the wizards in the lab and all the watermarks are removed. I think you will be happy with what you receive. Please let me know if I can be of help in any way. My contact information is on the sidebar.